One of the most confusing things about Irish genealogy is the proliferation of different administrative divisions of land and the type of records associated with them. Some areas can be very confusing with the same name used for a townland, civil parish and Roman Catholic parish, with each of them covering a different area of land that overlaps into other administrative divisions. 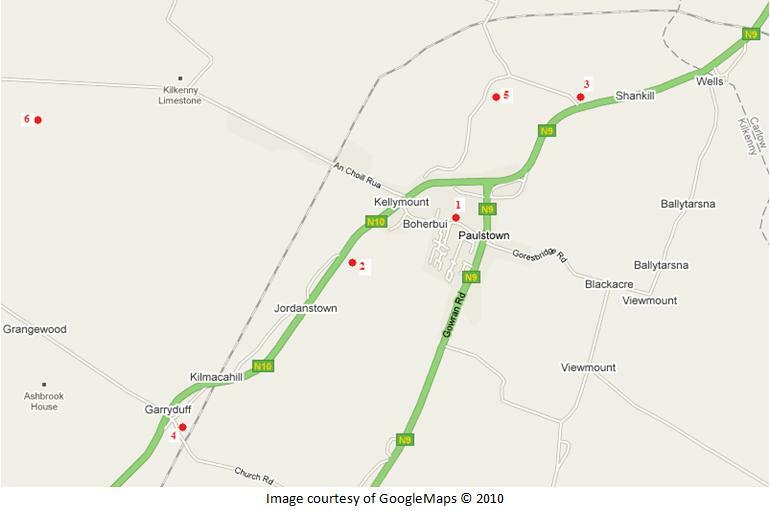 So, to help with genealogical research, I have a created a GoogleMap that shows all the different administrative divisions in the Paulstown area. When using this map it is best to ignore the place name labels provided by Google. I have used four main sources to create this map: the Kilkenny County Council online planning maps, the Ordnance Survey Ireland (OSI) online maps for Ireland, the OSI 6 inch maps from 1837-1842 and the OSI 25 inch maps from 1888-1913. These boundaries provide some interesting observations and anomalies. The townland of Jordanstown is divided in two by the civil parish boundary between Shankill and Kilmacahill. The townland boundaries along the N10 road, as it passes through the village, show the outline of the road before it was modernised. Part of the civil parish of Kilure (which is in county Carlow and is the neighbouring civil parish to Shankill) is completely surrounded by Kilmacahill civil parish, in county Kilkenny. Just one of the countless anomolies in Ireland. 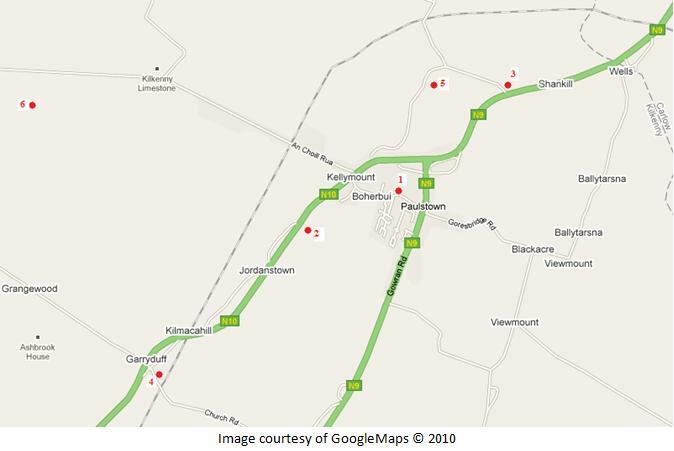 To get the best accuracy the map below is best viewed using the ‘Satellite’ tab. This will give a view down to the level of boundaries between fields and along roads. I have not included the townlands south of Kilmacahill and Paulstown townlands, in the Kilmacahill civil parish. This land survey is a record of all landowners who had at least one acre at the time. It was commissioned by the Lord Lieutenant in 1872. The survey was conducted before the wholesale transfer of land to the majority Catholic renters which was brought on by Land League agitation and various Land Acts. The listing below is for those who gave their address in the Paulstown area. All, or some, of the land that they owned might not be in the immediate Paulstown area. The two biggest owners of land are James K. Alyward of Shankill Castle and William Flood of Paulstown Castle. Two of the Flood family have an address given as ‘Viewmount, Gowran’, however some of Viewmount would be in the townland of Paulstown. Butler’s Grove, home of Pierse Healy is a neighbouring townland of Paulstown. Local Government Board. 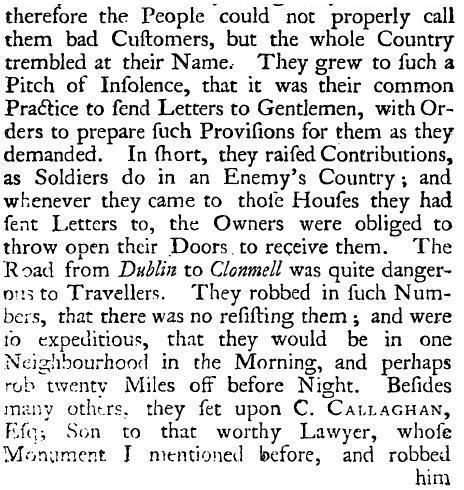 Return of Owners of Land of One Acre and Upwards, In the Several Counties, Counties of Cities and Counties of Towns in Ireland. 1876. Print. If you are planning on taking a trip to the Paulstown area to see where you ancestors came from then I hope this listing of graveyards and churches will be of help to you. It consists of the local Roman Catholic and Protestant Churches, current and disused graveyards and where an ancient Church once stood. This is the local Catholic church for the area. It is the oldest church in the diocese of Kildare and Leighlin. The church grounds also contain a graveyard. As far as I know burials are no longer carried out here. This is the current Catholic cemetery for the Paulstown area. A partial listing of burials from the internment.net website can be found here. This is the local Church of Ireland/Protestant church for the area. This church also has a graveyard on its lands. This cemetery is no longer used and is located in the townland of Kilmacahill, on what is known as Church Road. Dunleavey outlines that there was once an old church here, which was replaced by a Protestant church, but neither remain. This church and cemetery are located in the grounds of Shankill Castle. All that is left of this church is ruins. Members of different families who have owned Shankill Castle over the centuries are buried here. 6) This is believed to be where the ancient Kilmocahill monastery is located. Today this site is actually in the townland of Kellymount. All that remains are the traces of the church and graveyard and rubble. St. Finbarr of Cork is believed to have studied here. I hope to have a blog entry about the association between St. Finbarr and Paulstown at a later date. You can click on the image for a larger view. Dunleavy, John J. 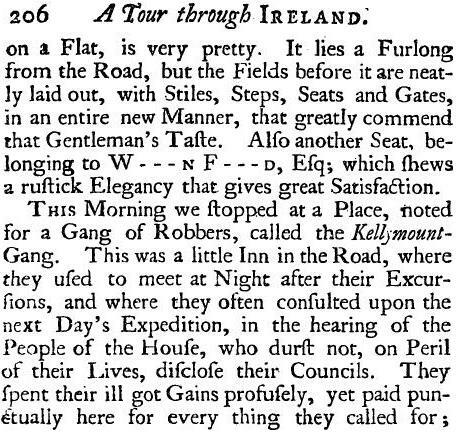 A Short History of Paulstown. John J. Dunleavy, 2007. Print. p.3.